For the full set of pictures (there are more than just the six ‘quoted’ above) and to see them in full size you need to go to the Photo gallery - Islay on Jo's Journal. 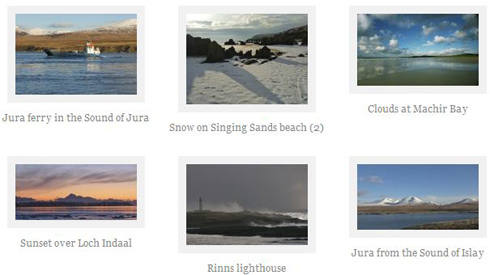 Jo is an author, editor and copy-writer working together with her husband Colin who mainly works on Wildlife Paintings (including some Islay wildlife paintings). As you can see he is also a very good photographer. While I'd encourage you to view the whole Photo gallery - Islay I thought I share some of my favourites: Rinns lighthouse (love the sunlit spray floating towards the lighthouse), Snow on Singing Sands beach (2) (the snow, the sun, the rocks, it just looks great), Sunrise over Carraig Fhada (the ferry in the haze in the distance, the clouds) and Swans and eiders on Loch Indaal, Islay, with Paps of Jura behind (the whites and the blues) are some I picked out.